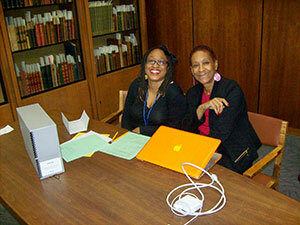 Mashadi Matabane, Randall K. Burkett's Graduate Assistant and Paula Whatley Matabane, Associate Professor of Television and Film, Howard University, Washington, D.C.
Mashadi Matabane and her mother, Paula Whatley Matabane, Associate Professor of Television and Film, Howard University, Washington, D.C.
“To my joy and exhilaration, I saw my 18-year old mother standing fourth from the end of the third row of choristers in the chancel of the historic Tuskegee Institute Chapel. My heart leapt with joy to see my beautiful young mother dressed in a lovely white dress (that I’m sure her mother or sister Garland made for her) with a corsage pinned on her left side, holding her songbook to “Hiawatha’s Wedding-Feast” by Samuel Coleridge-Taylor. I could feel the heavy pride, burden and weight that those teenagers and young adults must have felt in representing the race, to “prove” their worthiness and right to the tree of life. 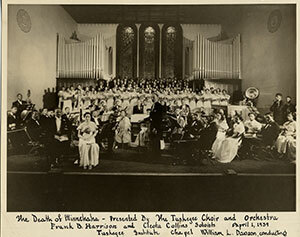 “The Death of Minnehaha” presented by The Tuskagee Choir and Orchestra, April 1, 1939. That was 1936. Mashadi put that photo and its folder back into box 60 and pulled out another folder. In the chapel with the orchestra, I saw Mama dressed in white with a corsage on the left, but this time she was on the front row at the very end holding a songbook. The date was April 1, 1939. The concert was ”The Death of Minnehaha,’ a concert name I was quite familiar with because Mama had saved the program, and after 76 years I still have it. Now I have a photograph that connects me more deeply and intimately to my mother’s memories. Staring at the photo, I wanted to ask Dawson for his assessment of Mama as a singer. Did her re-positioning onto the front row mean she was now a lead singer? Even more so, I wanted to hear the songs, hear her voice.